The PHH-128 indicator combines 5 meters into one easy-to-use wall mounting continuous monitor, featuring a large, duallevel, backlit LCD display. 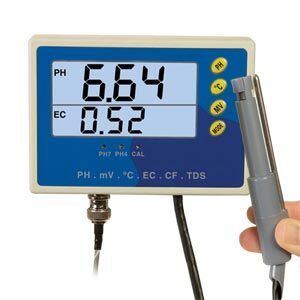 This meter can display the EC/TDS/CF (conductivity factor) of your solution together with the choice of either pH (probe sold separately), or oxidation-reduction potential (ORP) (probe sold separately) and temperature. The precision pH monitor immediately detects changes in solution pH or ORP. The multi-parameter water quality monitor is a versatile instrument with a reliable multi-probe system which is easy to read, economical and can be used by technical or non-technical personnel.